Don't try this at home! Merle Larson prepares to start a J-3 engine in flight over Concord CA in 1946. 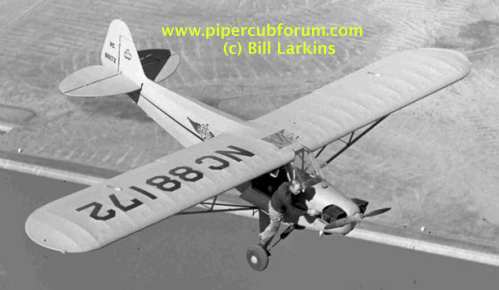 Gladys Davis is flying the Cub from the rear seat. Larson was a WWII B-24 veteran, airshow pilot, and aircraft designer — "and no circus daredevil," insisted Bill Larkins, who took this photograph. The preparation of the engine for starting is a very critical part of making propping easier (i.e., starting immediately). The method will vary with the ambient temperature, and whether the engine is cold or warm. I also do this on planes with starters to make it easier on the starter and battery. If the engine is cold, it should be pulled through until the carburetor sounds "squishy." In warmer weather, I just pull it through about 8 blades (compression strokes). In colder weather, I also rock the prop back and forth several times between compression strokes before going on to the next compression stroke. Do this a minimum of 4 compression strokes (on 4 cylinder engines) to allow fuel into all of the induction tubes. If there is fuel dripping from the carburetor onto the ground, the engine has been pulled through enough. These temperatures are approximate. Each engine seems to require slight variation. Leaving the primer unlocked acts like a choke and feeds extra fuel to the engine. This can be used when warming up an engine in cold weather. Lock the primer once the engine "takes throttle" smoothly. CAUTION: It is very difficult to start a hot engine when the primer is unlocked, because the engine floods. If the engine is hot, I do not pull it through at all. Pulling it through much at all will usually flood it. If the engine floods, make sure the mags are off, open the throttle, and turn the prop backwards very fast (preferably 2 or 3 compression strokes at a time). Do this several times. This requires more strength than propping. This will blow the excess fuel back through the carburetor. CLOSE THE THROTTLE BEFORE ATTEMPTING TO START THE ENGINE. Then, prop the engine with the throttle slightly cracked. Start the engine on both mags to give it as good a chance at starting as possible. The throttle should be fully closed, because the induction system is already charged with fuel. Something that will help make the engine turn over easier is multigrade oil (which is available in both mineral oil and ashless dispersant). I also think a metal prop is somewhat easier to prop than a wood prop because it acts like a flywheel through the compression strokes. Momentum helps out a bit. The secret of propping a Cub doesn't require brute strength. It is a technique that requires some simple timing. When the engine is not running, the prop is normally between two compression strokes. With the mags and fuel off, move the prop back and forth, and you can feel both of these compression strokes. The prop will want to return by itself to a position between them. You can rock the prop back and forth continuously, kind of like bouncing a ball. The secret to bouncing a ball is to hit or push the ball with your hand at exactly the time that the ball reaches the top of its travel and begins going down. It doesn't take much of a push to keep the ball bouncing. If you give the ball a more powerful push at the correct time, the ball goes higher on the next bounce. To easily prop a Cub, you use this same principle to your advantage. You pull the prop well into (but not through) the compression stroke. You then release all pressure and keep your hand on the prop while it "bounces" back into the other compression stroke. At the exact time that it reverses, you pull harder than the first time, and the prop should go through the compression stroke. Immediately pull your hand back. I never need to, but I suppose it would be possible to rock back and forth more than once. It may take a few times to develop the feel of doing this. You can practice with the mags and fuel off without flooding the engine. I call this technique "flicking" the prop. The engine doesn't have to be pulled through rapidly. The impulse mags are designed to snap and create a spark. However, I have found that there seems to be a minimum speed that reliably starts the engine. Many people grab the prop too far out on the blade. The force to pull through the compression stroke becomes less as you grab further out, but the speed at which the engine is rotating is also less. Thus, many people can't reliably start the engine, even when they successfully pull the prop through compression (too slowly). I find that grabbing the prop about half way out on the blade and "flicking" it gives the best results for me. The way I prop a Cub is from behind the prop, one foot in front of the tire to "chock" it, one hand holding the front of the door opening for balance (I don't want to fall into the prop), and the other hand on the prop. Most people are right handed and do this facing the plane. I am left handed and do this facing away from the plane. Using these techniques, I can usually start a cold engine on the first pull, and a hot engine on the first, second, or third pull (the more it has cooled, the more pulls it takes). Posted February 2016. Websites ©1997-2016 Daniel Ford; all rights reserved.